From tide pools to coral reefs and the open ocean beyond lies a world abundant with an assortment of colorful fish, other fascinating creatures, and plants. The lure of this life of the ocean's reefs and open water is no secret to scuba divers and snorkellers, who crave the opportunity to gaze upon this wonderful world through their dive masks. 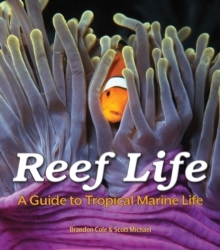 This guide to tropical marine life identifies all the most likely encountered marine life in magnificent colour photographs that provide the keys to this magnificent world. In this gallery of more than 400 species readers will find extensive identification of the largest families of fishes and other ocean life. Each entry includes the name, scientific species, habitat, range and a description particular to the animal or plant. With its sections on invertebrates and algae, this guide reveals the wide range of animals and plants in the undersea ecosystem. Also included is behavioural information on feeding, mimicry, and symbiosis, providing insights into the survival strategies taking place among animals beneath the ocean surface. The clear, concise descriptions for more than 400 species are collected in this handy, portable and comprehensive reference for use in the field or at the desk. The surveys of the tropical ocean regions and sea life around the world include: The Caribbean; The Hawaiian Islands; French Polynesia; The Fijian Islands; The Philippines and South China Sea; Micronesia; The Indonesian Archipelago; Papua New Guinea and the Solomon Islands; The Great Barrier Reef; Western Thailand and Andaman Sea; The Maldives and Western Indian Ocean; The Red Sea; Tropical Eastern Pacific.